Today with it being the 135th Anniversary of the birthday of Author A.A. Milne, we are Returning to Pooh Corner for Letter Writing. 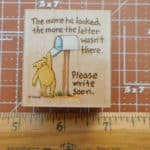 There are Winnie-the-Pooh Thank You Note Cards and a Please Write Soon rubber stamp. And be sure to read this short article from September 2014 about the Story Behind the Song: ‘House at Pooh Corner’. It is really a great interview with Kenny Loggins by Dave Paulson. “Kenny Loggins was a 17-year-old high-school senior, staring down his impending adulthood, when he wrote “House at Pooh Corner.” The song was inspired by A.A. Milne’s 1928 book “The House at Pooh Corner,” a collection of short stories about Winnie the Pooh and the rest of the inhabitants of the Hundred Acre Wood.” … <–Be sure to read the article! And yes, I’ve included Kenny Loggins “Return to Pooh Corner” to listen to while dashing off a letter today; I’ve already gone ahead and ordered the 1994 CD of the album. To read it includes a song “Neverland Medley” (“With Patti Austin, introduction by Gene Wilder “Reprising” his role of Willy Wonka”) – I know it will make its way in a future blog post, probably one Saturday! It is fun to see Kenny Loggins birthday is also in January, it was earlier this month. The wonderful backup vocal is Amy Grant which I love hearing. 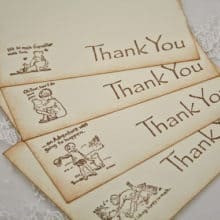 The image upper left is of this adorable Set of 10 flat cards, postcard style offered at Etsy, by BabyOnTheWings. It is 5 1/2″ x 4″. The Ivory cardstock is Hand stamped with chocolate brown ink with Vintage inspired edges. There are Ivory envelopes included and is Packaged in a clear cellophane sleeve. Not to ruin the surprise for any of my penpals but harkening back to my very first blog post here I’m using the expression “There’s Been Talk” I’ve already ordered a set of it for letter writing! Story Behind the Song: ‘House at Pooh Corner’ by Dave Paulson, dnpaulson@tennessean.com Published 2:00 a.m. CT Sept. 7, 2014 | Updated 9:39 a.m. CT Sept. 7, 2014. Wikipedia “Return to Pooh Corner” “Return to Pooh Corner” Kenny Loggins 1994 children’s music album. YouTube Return To Pooh Corner by Kenny Loggins posted by scout. Uploaded on Jan 28, 2011. AnchoredScraps.com blog post: “There’s Been Talk” February 26, 2015 by Helen Rittersporn.